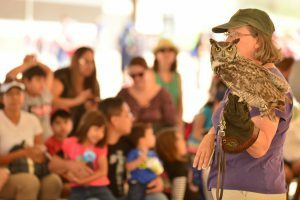 PHOENIX — The Arizona Game and Fish Department manages more than 800 native species and the public is invited to meet several of them Saturday, Nov. 18 during Wildlife Day. This free family friendly event runs from 10 a.m. to 3 p.m. at Sportsman’s Warehouse at 19205 N. 27th Avenue in Phoenix, near Interstate 17 and the 101 freeway, and is designed to allow the public to meet their wildlife neighbors up close, while helping raise funds for the AZGFD Wildlife Center. Staff and volunteers will be on hand to provide information about Arizona’s wildlife. Visitors can also view and photograph live animals, including prairie dogs, a ringtail, reptiles, various owls, hawks and falcons. A number of preserved native mammal skins and skulls will be displayed. The event is being held in collaboration with the Adobe Wildlife Center Auxiliary and, Sportsman’s Warehouse . The Auxiliary will be selling wildlife-related holiday merchandise and raffle tickets for two drawings. Other nature-related vendors and organizations will also be present. The wildlife center is operated by AZGFD with a small budget from the Heritage Fund, a voter-passed initiative that provides for wildlife conservation and education through Arizona lottery ticket sales. It also receives some financial and volunteer support from the Adobe Mountain Wildlife Auxiliary (www.azwildlifecenter.net) and the general public. Monetary contributions will be graciously accepted from those wishing to support the relocation of the AZGFD Wildlife Center, outreach education programs, and its efforts to care for wildlife treated at the Wildlife Center.